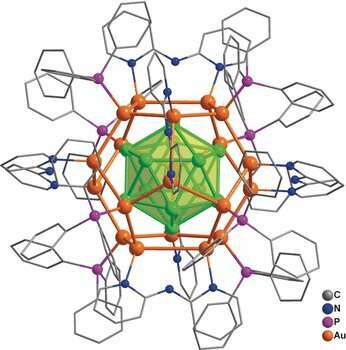 A team led by Jun Li and Quan-Ming Wang (Tsinghua University, Beijing, China) has now achieved a synthesis of a nanocluster made of 32 gold atoms in solution. The synthesis involved the direct reduction of gold-containing precursors. The formula of the compound is [Au32(Ph3P)8(dpa)6]+[SbF6−]2 (where dpa = 2,2'-bipyridylamido ligand and Ph3P = triphenylphosphine ligand). The structure consists of an arrangement of 12 gold atoms in a cage of 20 gold atoms—described as Au12@Au20—that is protected by eight Ph3P and six dpa ligands bound to the surface. With a combination of analytical methods and computer calculations, the scientists were able to completely determine the structure: its geometry, its chemical bonding relationships, and its electronic structure. Andreas Schnepf and co-workers from the University of Tübingen (Germany), Howard University (Washington, D.C., USA), and the University of Missouri, Kansas City (USA) independently reported the synthesis of a cluster consisting of 32 gold atoms. This study was submitted to the journal Angewandte Chemie shortly before the work of the Chinese team was received. Their simple synthetic route yielded a compound of the formula Au32(R3P)12Cl8 (where R = ethyl, n-propyl, or n-butyl group), also with a Au32 cluster kernel. In this case, eight chloride ions and twelve phosphine ligands each equipped with three short alkyl chains (R3P) are bound to the surface. The researchers observed that the gold icosahedron as well as the gold dodecahedron are slightly distorted. The distortion results from the electronic structure and the electrical field within the cluster core (Jahn-Teller effect) as quantum-chemical calculations showed. The length of the alkyl chains did not influence the structure of the cluster.